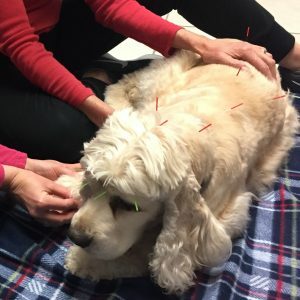 Parker is a cocker spaniel that was treated for right sided, idiopathic facial paralysis of 5 months duration using acupuncture and massage. He received a total of four treatments but showed little to no improvement and consequently therapy was terminated by the owner after the fourth session. This case leaves us with a few questions. If the owner had agreed to more sessions, would we have been successful in curing the patient? Do we have a misdiagnosis, i.e. is the cause of the paralysis not idiopathic? Is the desired outcome beyond the current skill level of the practitioner? Parker is a sweet, 11 year old, male neutered American cocker spaniel who came to see me for facial paralysis. Parker has been a patient at our clinic since 2015. He had a history of atopy under therapy with Apoquel and had been diagnosed with facial nerve paralysis on the right side by the local board certified ophthalmologist on 1/24/18. He also was diagnosed with KCS (Keratoconjunctivitis sicca) in both eyes on 3/17/14 and is currently being treated with Tacrolimus OU and Genteal Gel in the right eye SID-BID. Parker has been taking Cosequin SID for an undisclosed amount of time. Since his diagnosis on 1/24/18, he has had neither improvements in his paralysis nor worsening of symptoms. 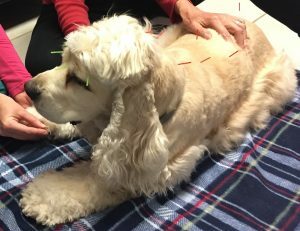 After discussions with his owner on the possibility of improvement as well as the potential side effects of acupuncture treatment, she agreed to try acupuncture for his facial paralysis. Exam completed during the first acupuncture session (6/12/18) showed that there was no menace response or palpebral reflex on the right eye. Both palpebral and menace were present/normal in the left eye. The right upper lip was very slightly droopy and hung below the left lip but ear movements were normal bilaterally. Myofascial examination was overall unremarkable with mild taut bands on the right hindlimb musculature (quadriceps). Parker’s gait was normal and he trotted happily, with spring in his step and extra energy to pull. A full otoscopic exam revealed no abnormalities. Overall Parker is a healthy dog and managed well on the Apoquel per the owner. Facial paralysis has many potential causes including hypothyroidism, inner ear infection, trauma, injury, neoplasia, or idiopathic. The putative diagnosis in this case is right sided facial paralysis, most likely idiopathic. This conclusion was reached as all other causes were ruled out as best possible considering cost to owner (except neoplasia and unknown/unwitnessed injury or trauma). As per the ophthalmologist’s recommendations, a full Blood Chemistry, CBC and total T4 were were run on 1/29/18 which all returned within normal limits. 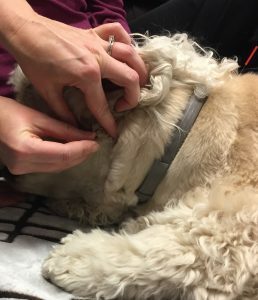 Having ruled out hypothyroidism and inner ear infection to the best of our abilities, the owner decided to try acupuncture. Review of the literature and Curacore modules on the subject led me to a solid, but fluid treatment plan with attention to central, peripheral, ANS (Autonomic Nervous System) and myofascial components. During the first session (6/12/18), all areas were treated with dry needling and some also with massage. A variety of points were used including GV 14, 20 and Bai Hui (red needles) to help with the ANS. The remainder of needling was done with the lime green needles (0.14 X 15 mm). Of course TH 17 was used bilaterally because of its proximity to the stylomastoid foramen and therefore it sits right at the exit point for the trunk of the facial nerve. Needling of BL 2 was aimed at a peripheral approach to the facial nerve paralysis and to neuromodulate the ANS by reducing the sympathetic tone. This would in turn help stimulate tear production and decrease dryness in attempt to treat the KCS. BL 10 was used bilaterally to treat possible trigeminal neuralgia and improve circulation to nerves using the trigeminocervial reflex and vagal neuromodulation. The addition of LI 4 was instituted for many reasons. LI 4 works to tone down the sympathetic pathways while also treating head and facial pain. It is an autonomic neuromodulator as well as the master point for the face and mouth. ST 36 and GV 20 were used for their parasympathomimetic effects. Laser therapy with a K-laser unit was attempted on TH17 during the first session but the patient had a strange jerk response (possibly painful) and was never attempted after that. The owner was very disturbed by Parker’s response to the laser and I had never experienced this particular reaction in a patient but assured her it was likely an oversensitive area for him. Session 2 took place on 6/14/18 and all of the previous points were used with the addition of some local tender points using red needles along the mid thoracic spine, paralumbar musculature closest to T12 and the TL junction. Also GB 20 was added bilaterally as a caudal point to treat the KCS problem. The third session took place on 6/18/18 and the same points were again used from session 2 including local points in paralumbar locations. Finally, the fourth session was added last minute when the owner decided she wanted to do one more try. It was conducted on 6/21/18 and included all previously mentioned points along with LI 20 and ST 6. LI 20 on the right side only was used because of its inclusion in the treatment by Jeong et. al during their study in acupuncture for facial paralysis and as a peripheral point to the lip (which was still a little droopy at this time). ST 6 is supplied by the facial nerve and stimulation/massage on the right side was directed at helping relieve any restriction or compression of the nerve in this region. Parker is an ideal patient in many ways. He is slightly nervous but accepts needling very easily. Luckily, he made possible needling around the eyes as well as the face. Unfortunately, even with a protocol that was based heavily on acupuncture points that have shown great success, no success was achieved in this case. After his first session, his owner responded that he had some mild twitching on the ride side of his face under his ear once. This never happened again to my knowledge but at the time, gave me some hope that the needling stimulation was working. After the second session, the owner remarked that she thought she saw some movement on the upper right eyelid but during that third session exam, there were still no lasting changes. After seeing no improvement at the beginning of the fourth exam I decided to try some new points, in hopes that my plan simply needed revisiting and more stimulation. This failed as well. There are likely a number of factors that led to the unsuccessful outcome in this case. The most important factor is probably the lack of experience in myself (the practitioner) and small number of sessions. However, in the Jeong study there were only six treatments total and they had improvements after the first session. Other theories are that the needles were too small. Using lime green needles on all of the facial points and only red on the GV and BL line may have been a poor decision and perhaps in the future needling with red on TH17 will be performed. Still another possibility, though hopefully not the reality, is that Parker has a tumor or trauma that has caused irreparable damage, and therefore no treatments may lead to a successful outcome. 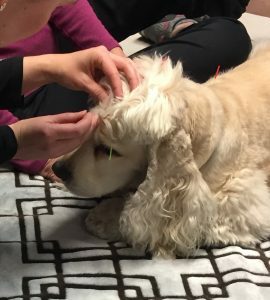 Jeong, S.M., Kim, H-Y., Lee, D-H., Kweon, O-K., Nam T-C. (2001) Use of acupuncture for the treatment of idiopathic facial nerve paralysis in a dog. The Veterinary Record. 148. Page 632.